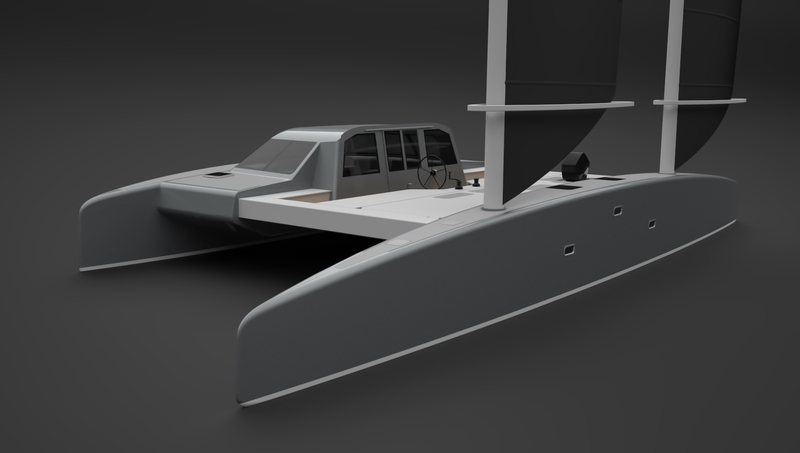 The C60 is for people who enjoy sailing. A perfect ocean voyager, but simple enough for a quick sail after work. The best word to describe it is easy. Easy to build, sail and maintain. 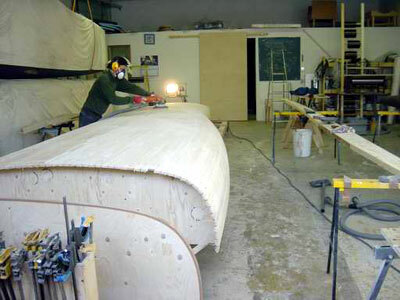 Building takes about two thirds the hours and materials of aconventionally built boat, with almost none of the mess, grinding, sanding, secondary laminating and fitting of fiddly components. 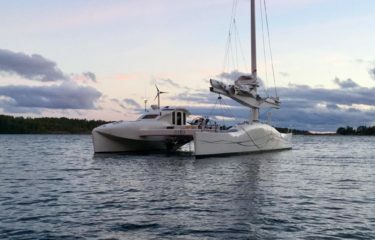 It has a large, simple rig that can be handled by one person without electric winches and totally depowered on any point of sail, with no foredeck work, flogging sheets or expensive deck gear. There is no need to reduce sail at night, worry about uncontrolled gybes or getting in irons and no struggling with jammed headsails at 2 am. Unlike tacking, shunting does not require boat speed. Therefore, in strong winds, only enough sail is required to propel the boat. 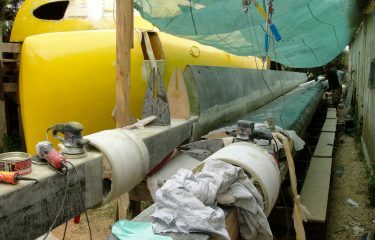 The white knuckle element of strong wind sailing is removed. 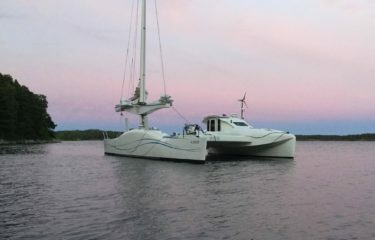 The layout is uncluttered with separate cabins and bathrooms, inside and outside steering, large airy saloon, huge outdoor lounging area, shallow draft, minimal gear and large kick up/liftable rudders mounted above the water line. The open, flat deck space is 9m/30′ x 8m/26′, with comfortable seating for at least 30 people, and 2 x 8 person tables. A removable awning keeps the entire area shaded if required. The galley is on the same level as the saloon and shares some of the hull space with the two separate bathrooms. All the plumbing is in one place, saving weight, cost and build time. There is additional, easily accessed storage space in the two saloon table modules, or space for fridge/freezer. The seating is divided into two zones for a more flexible use of the space. If one of the tables is occupied for navigation purposes the other is still free. Tables in “dinner mode” seats 8 – 10 people very comfortably. 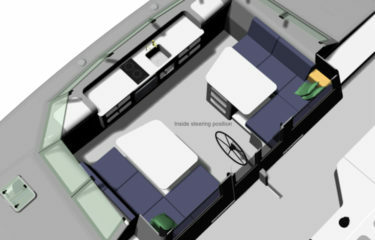 The saloon has large sliding windows and double doors for ventilation and access to the bridgedeck. 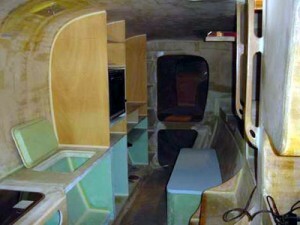 Below deck hatches provide cool air movement on rainy days, making aircon unnecessary. 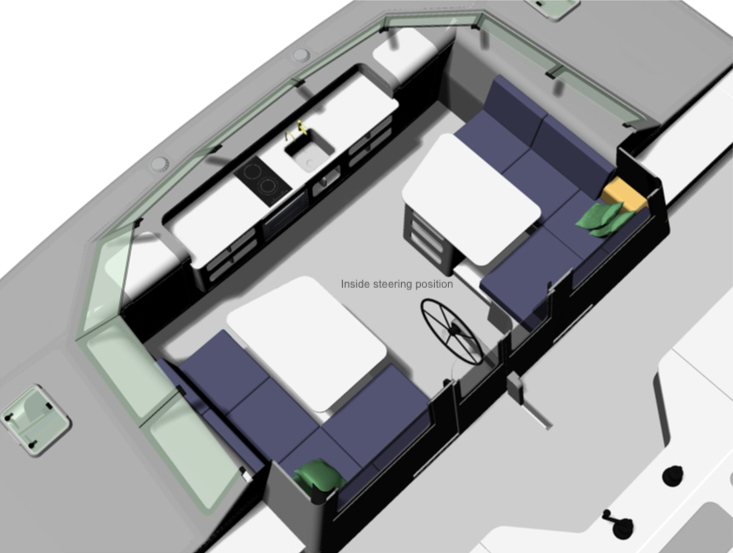 There are 2 double cabins in the windward hull, each with en suite bathrooms/toilets, hanging lockers and plenty of storage space. 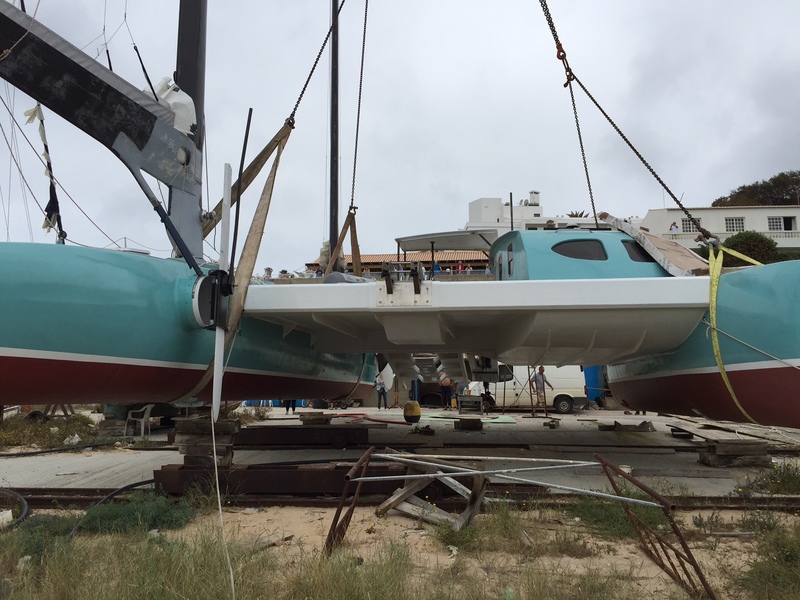 The leeward hull has 2 single cabins with separate entries, easily accessible storage space at the ends and under the bunks and a shared bathroom. 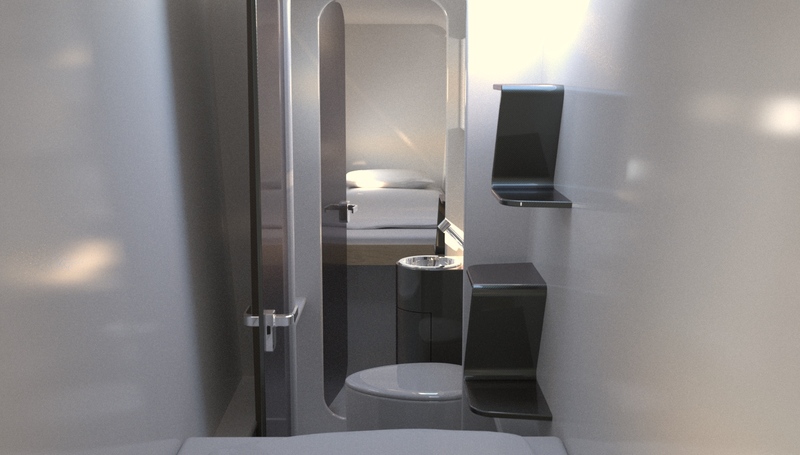 The bathroom contains a sink, shower and toilet with overhead lockers. One of many unique features of the Cruiser is the helm. A single wheel on a strut that can be rotated to allow internal or external steering, both with near 360 degree views. The outside location is slightly raised for visibility over the cabin. 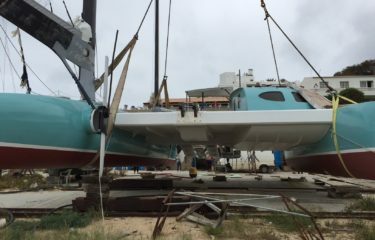 The main sheets and halyards are lead to winches adjacent to the wheel and comfortable fold down seats allow steering without being cut off from the rest of the crew. 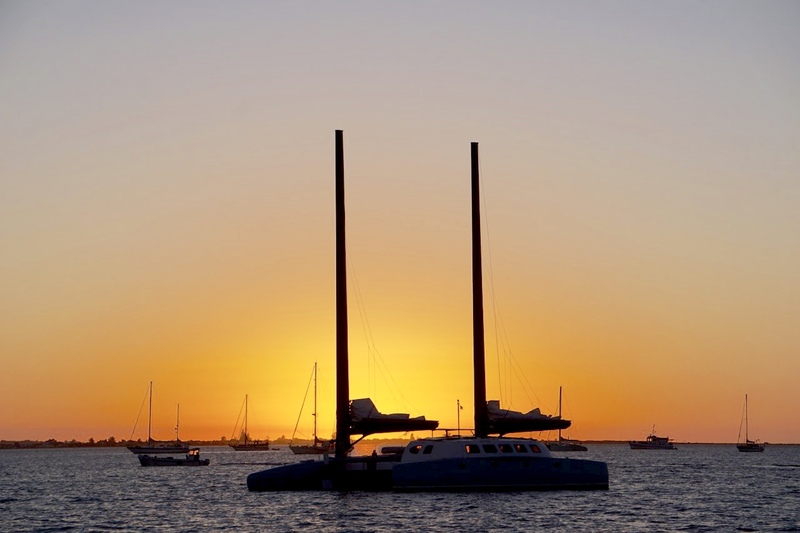 The view of the sails and the ease of adjusting them is, quite simply, better than on any other boat. The winches double as anchor winches. No need to yell at someone on the foredeck to get the anchor up. They are standing right next to the helmsman. And in an emergency, the anchor is dropped without leaving the wheel. 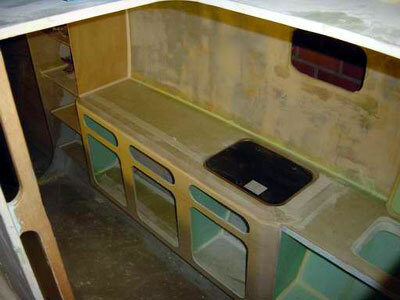 The wall between the cockpit and the saloon cockpit wall can be roll up plastic or fixed panels with removable or opening sections to connect the inside and outside area. 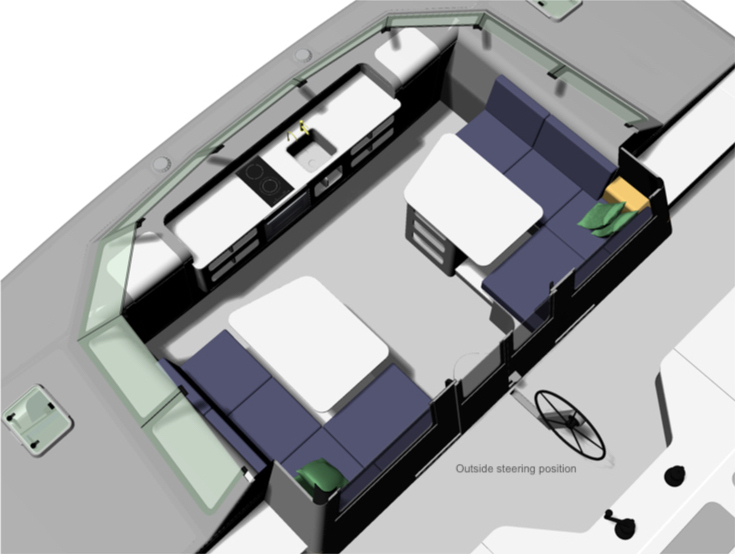 Sheltered seating outside is not required, although a bimini top can be added if required. Outside there is plenty of space for lounging. 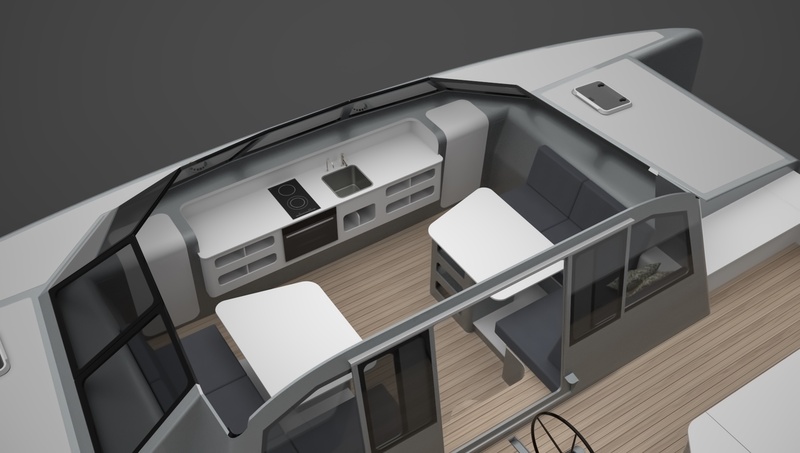 The fore and aft seating is perfect for watching the scenery go by either in front in the breeze or aft, sheltered by the cabin top watching the wake. A table can be put up on deck to make a large dining area for a late night in the mooring, or at sea without being in the way of the sailing. The «toy box» between the beams serves as a huge storage space for surf or paddle board, diving gear, fenders, ropes, cushions, the outside dining table etc. It is also an alternative place for batteries and/or a generator. The sheets are led inside the box to the turning block at the beams to provide an uncluttered deck area with more available area to sit. The toy box also holds the hidden anchor and chain system. 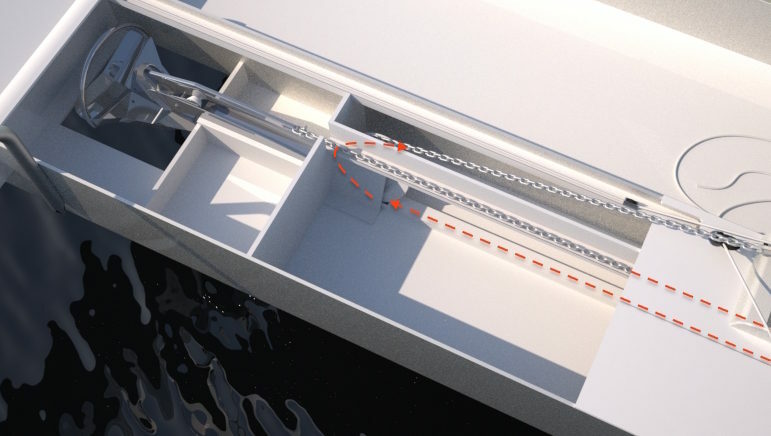 There is no need for a chain locker or a heavy windlass. 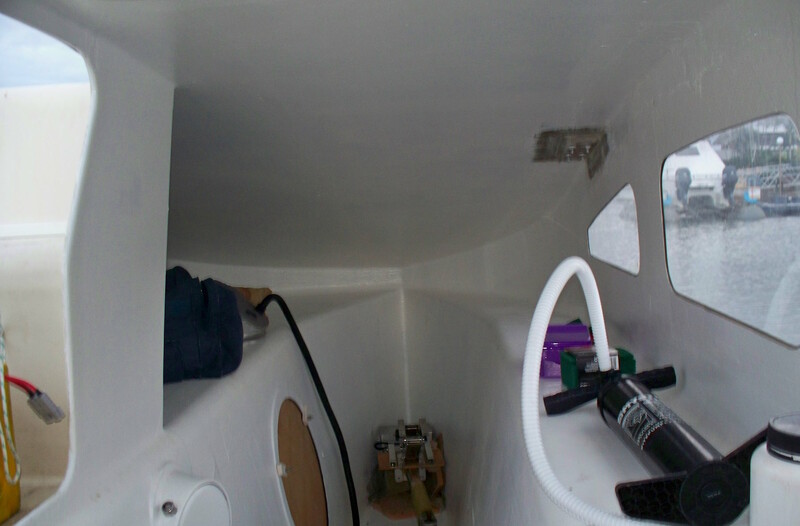 The mooring line is led inside the toy box going from beam to beam before entering one of the two winches on the winch pod. As you pull in the line the chain is stored between the beams before it enters the winch, and the anchor is in place on the roller. The unstayed rig is the only sensible rig for a cruiser. 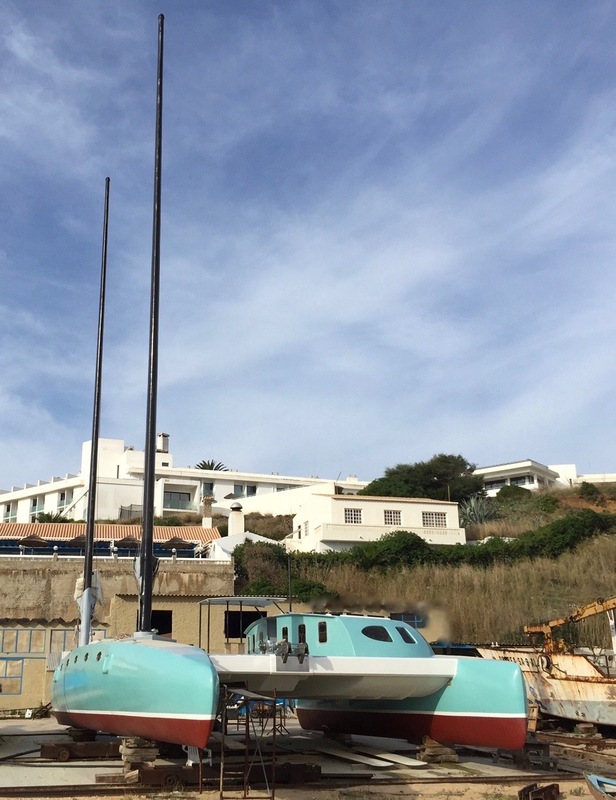 See FAQ’s The ballestron rig on the early harrys has been replaced by a schooner. 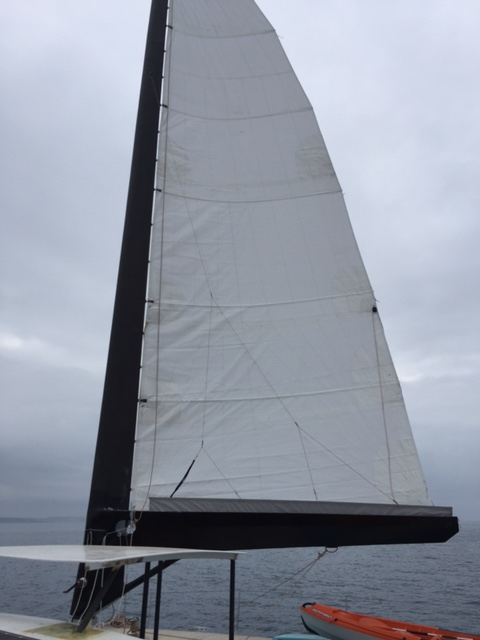 The sheet loads and the costs are a little higher, but they provide more sail area, better control (no sagging headstays or flogging jibs), better balance, higher reaching speed, fewer things to go wrong and more usable space in the lee hull. They are extremely easy to trim. One line controls the mast bend, foot and leech tension. 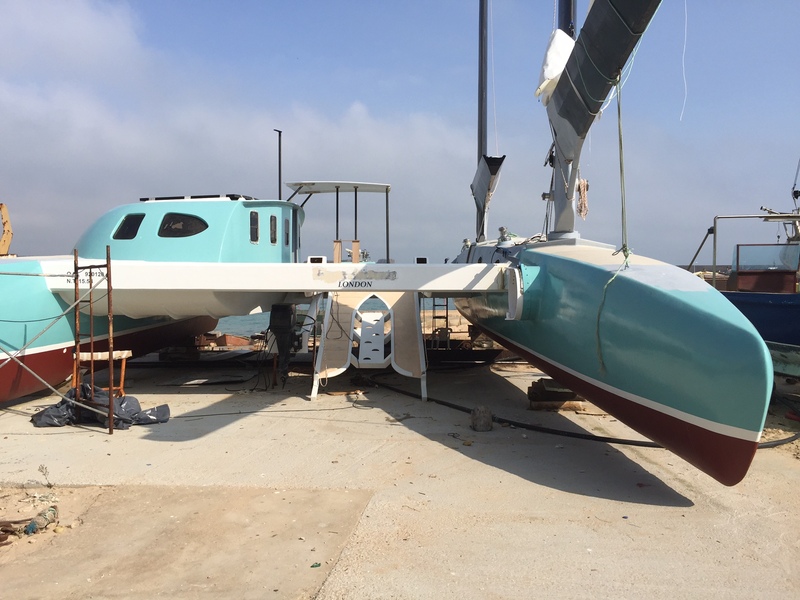 The required range of adjustment is far smaller than on a boat with a mainsheet track, so a simple 6:1 purchase and cam cleat is sufficient. 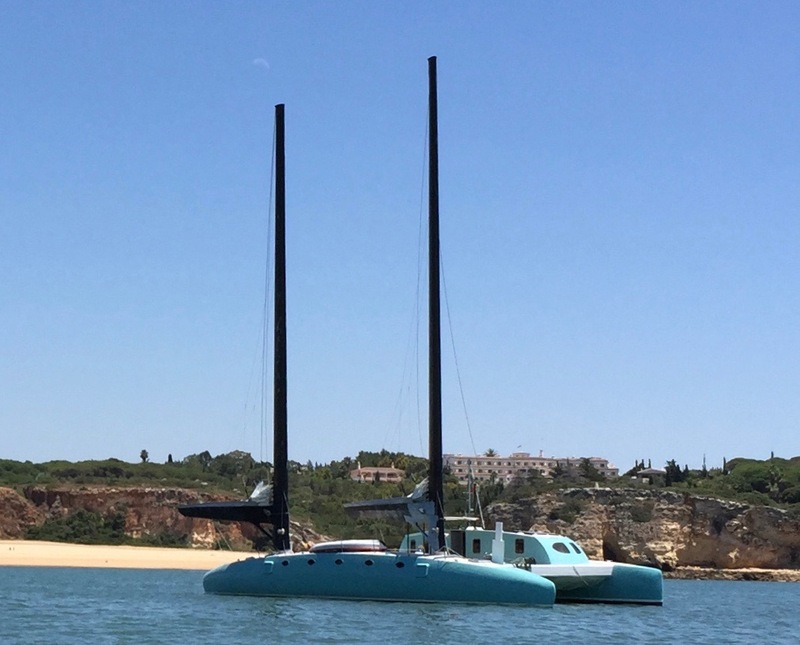 Some innovative thinking means this control is also used for all three reefing lines, without having to lower the sail to rethread it. 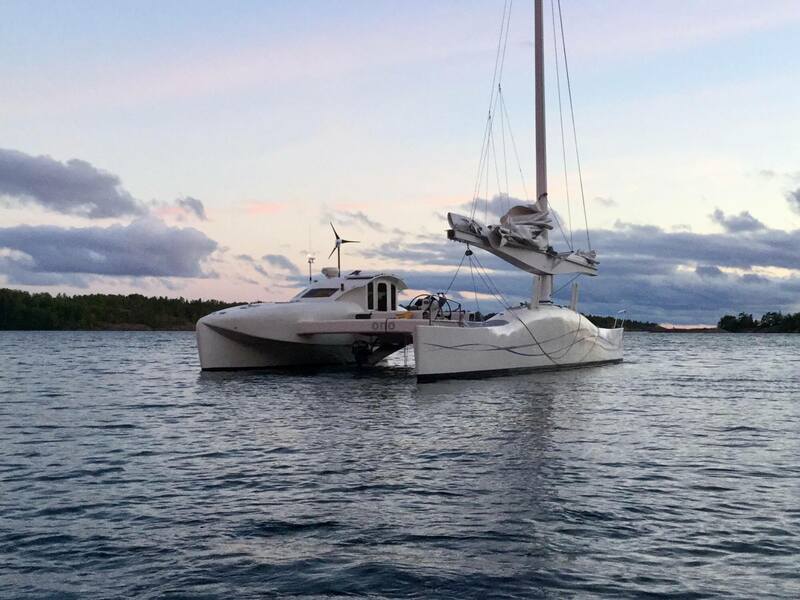 The halyards have a simple, fail safe lock on the mast at each reef point. 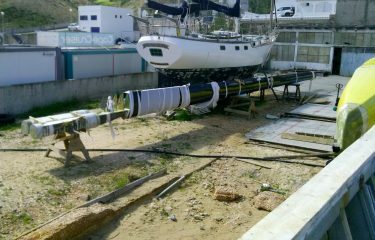 The halyard can be thinner, the mast bending does not alter the halyard tension and internal halyards become feasible, without chafe. 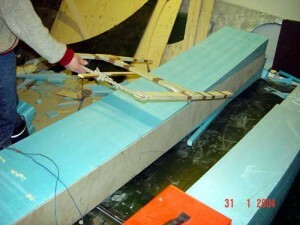 Luff tension is provided with a simple block and tackle. The booms are wishbone booms. 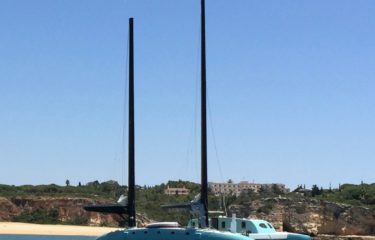 These are above head height for safety reasons, are horizontal to minimise windage and have loops of string under them to catch the sail, which is much easier than flaking and lazy jacks. The sheets are lightly loaded as they are not supplying leech tension and lead to the winches at the helm station via blocks on the beams. 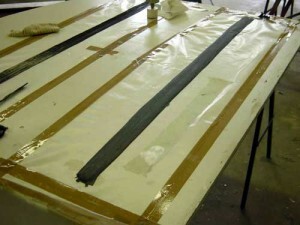 This ensures that, even if the boat is caught aback, the sails will weathercock, allowing plenty of time and no stress while the boat is steered back on course. 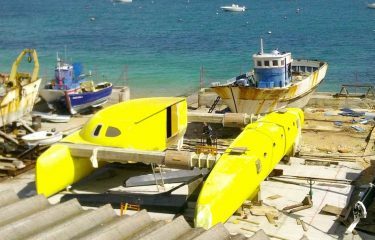 Tenders are usually too small and slow for anything other than ferrying part of the crew to the shore in calm seas. They are boarded sideways from the often pitching stern or over high topsides. An accident looking for a place to happen. 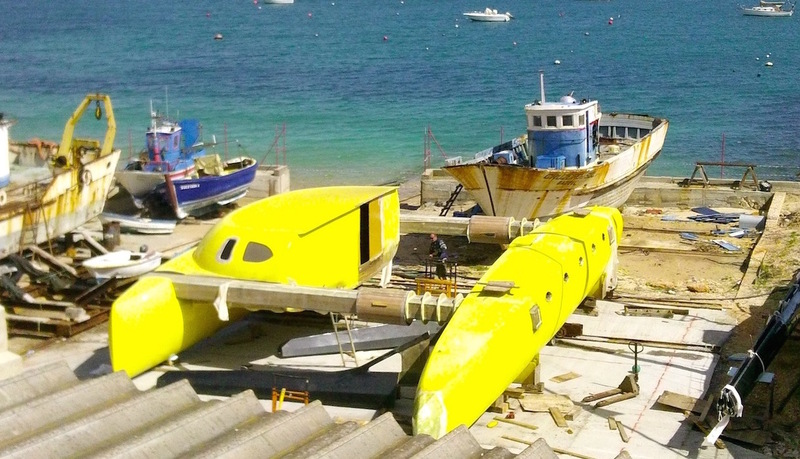 The harry tender is 7.6m/25′ long with enough payload for a large outboard. 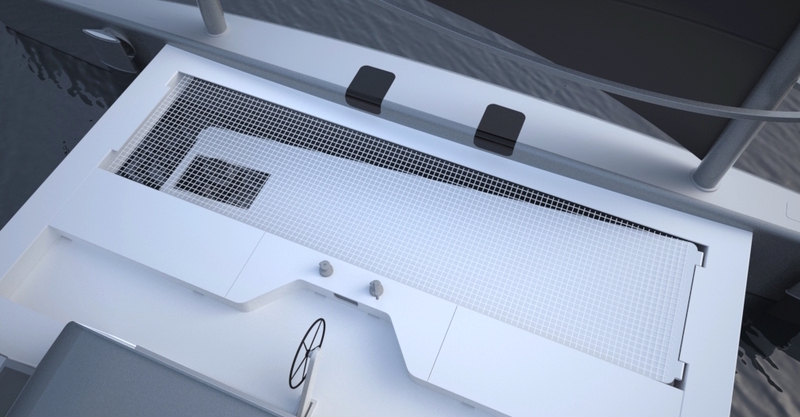 It can be boarded via fold down steps or be partially lifted into it’s storage place on the bridge deck. In this position, it is stable and loading/unloading is safe and easy. 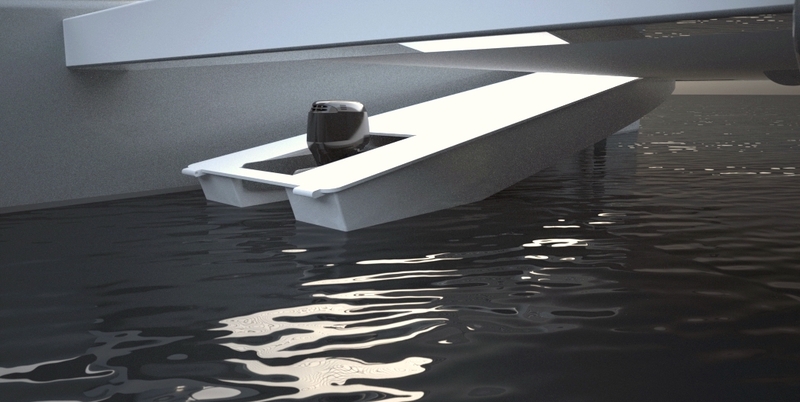 The stern can also be lowered, allowing the outboard to be used to propel the boat, saving the weight, cost, maintenance and complexity of a separate engine. An easily deployed electric thruster is located next to the helm, allowing for 360 degree thrust for close quarters maneuvering. The design of the Cruiser series has evolved from the flat panel design and building technique of the Bucket List prototype. 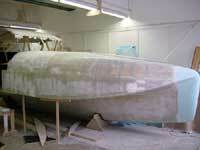 The hulls are infused in flat panel moulds to reduce build time and weight, and increase the quality of the product. The bridge deck can be made in modules or as one separate part joined to the hull side when the interior is in place. 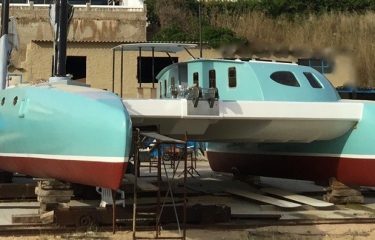 When the windward hull halves are joined it is basically a closed unit with entries to the two separate cabins. Everything is infused, ensuring a high quality laminate and saving hundreds of hours making and fitting doors doors and hatches and local strengthening for fittings. The furniture is built from flat panels, then bent and glued in place. 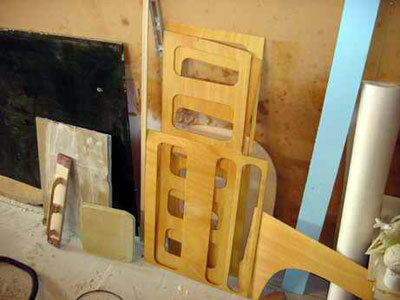 Bulkheads, shelf and stringer location is included in the infusion, then glued in place without any need for fillets and tabbing, or the interminable sanding required to fair these in. Joins are male/female, ensuring strength and accuracy. There is no post infusion edge treatment or cutting and grinding of cured glass. 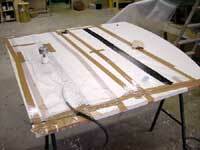 The foam is cut to shape with a utility knife, the glass with scissors,then laid accurately in the mould. This is easy work, with plenty of time to check it is correct. 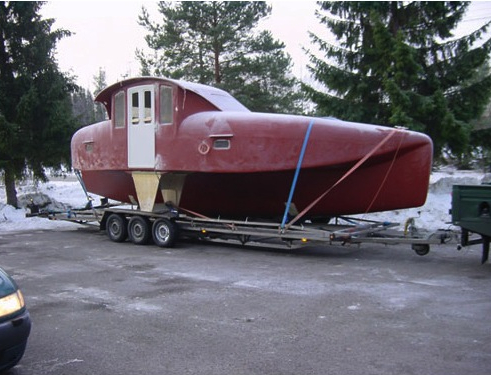 2 x singles in the leeward hull; also the option of converting saloon table to double berth. 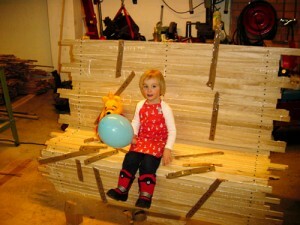 Approximate Building Time: The build time is impossible to estimate as no 2 builders are the same. Suffice to say, it will be near enough half the time it would take using conventional methods. 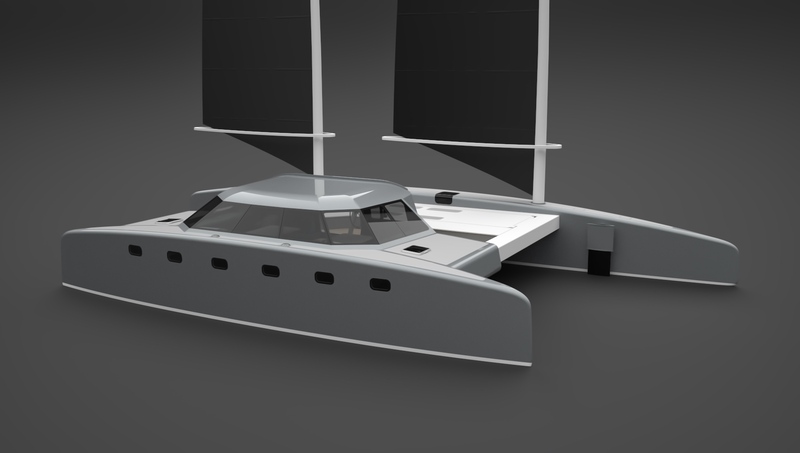 Below is a walk through animation of the initial C60 design. How would you rate your satisfaction now she is sailing? I’m well happy with her sailing and she has performed beyond my hopes and expectations. Having said that, we have still not sailed her in all conditions. 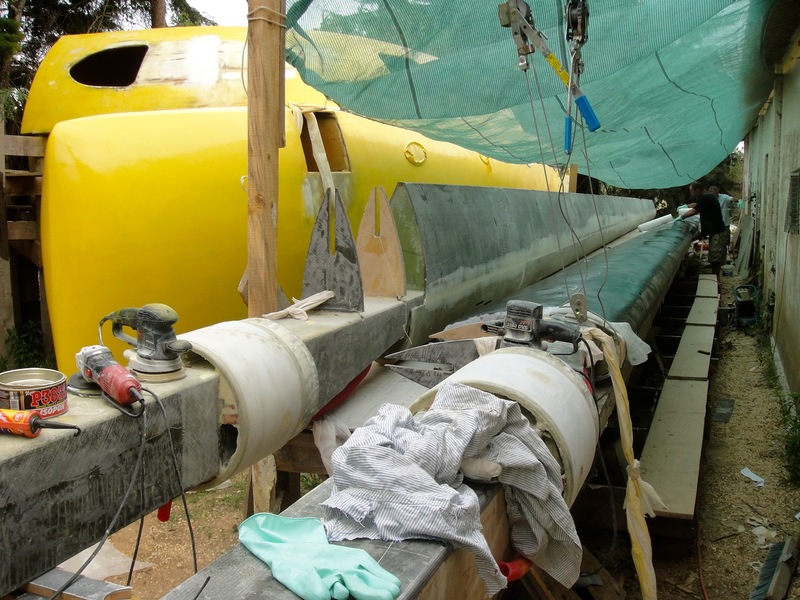 Are you happy with the bidirectional rudders and associated mechanisms – are they a keeper? Bidirectional rudders work well and are def keepers. Any rounding up tendencies at low speed? 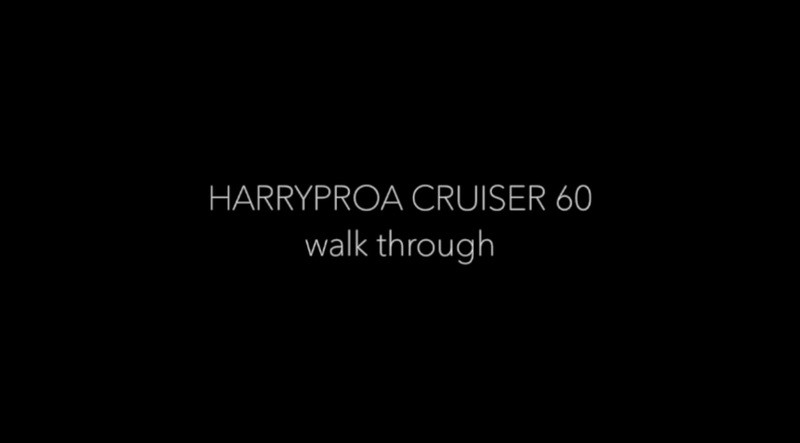 Bear in mind I sail semi regularly on the 60 ft custom harry in Melbourne , so have watched its development. Absolutely no noticeable rounding up at low speeds, and she sails at around six knots in 8 knots of wind. I put it down to the square top, large roach and especially the wing masts. 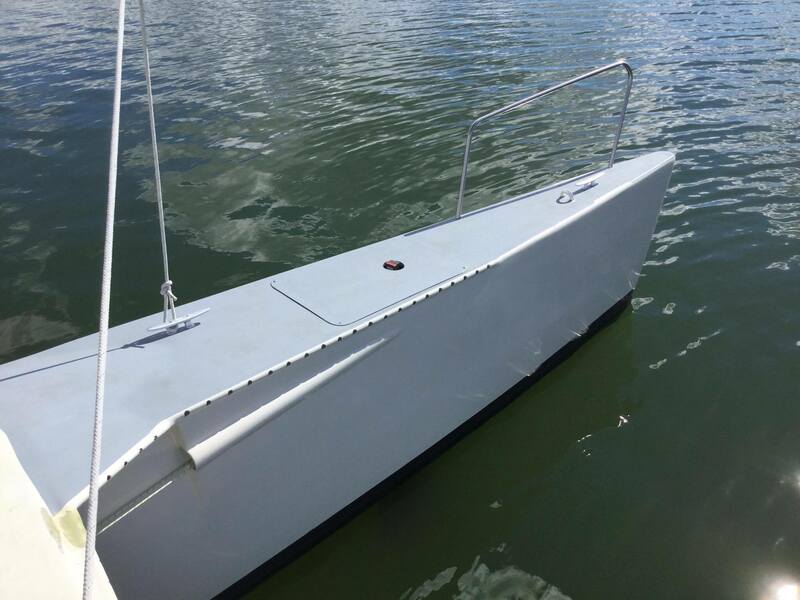 In hindsight I would probably forget about the square top as they make for difficulty stowing the sails in the covers, and were only originally included to help spill wind in gusts. 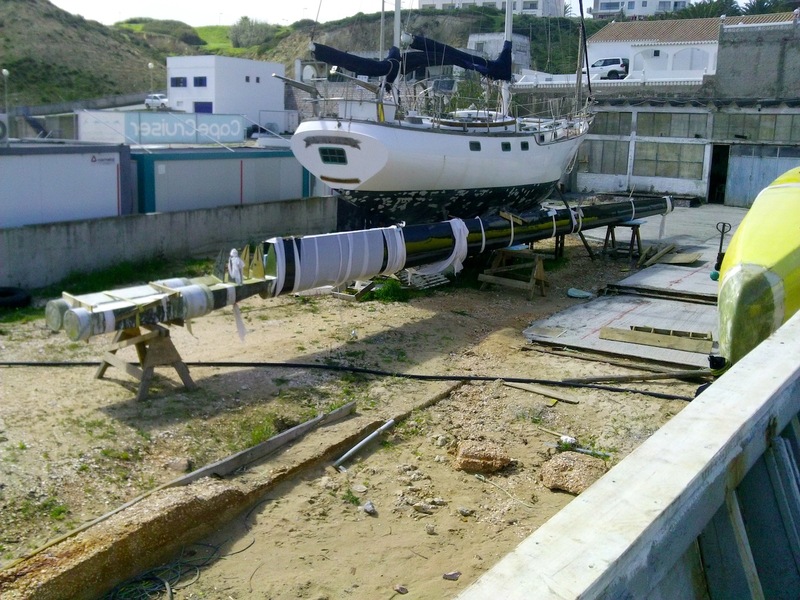 I have actually found that the upper mast bend in gusts serves the same purpose, as it was designed to by Peter at Etamax. 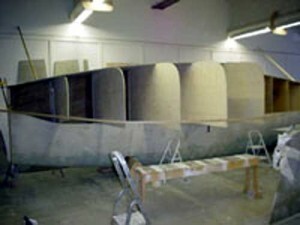 Similarly the schooner set up. Took a long time to persuade Rob to use a schooner set up, ​(edit: Rob is now a big fan) ​and I have found it makes for a doddle when shunting. It also gives the ability to balance the sails, and I have found myself able to run for over 20 minutes without having to adjust the tiller. I think you mentioned if you were to start again you would go lighter and simpler. 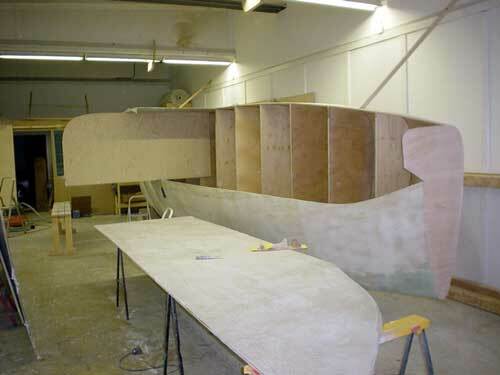 I would not go lighter and simpler on the hulls as I like the shapes attained, and have found from experience that the cedar absorbs far less epoxy than Airex foam, so the end result is not much heavier. Just over 1000 kg for the 20 m bare lee hull. The booms are an unnecessary extra weight,and were made with ply while I was away on a long work schedule, NOT to my specs! 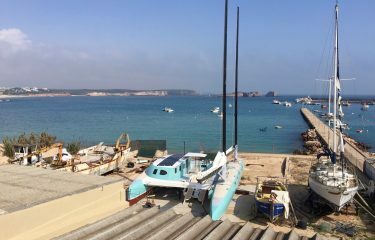 From Robin Warde – We just made the trip motoring at the start with no wind and ending the day in 25 knots. Most pics and videos taken when doing around 9 knots in 15 knots of wind on a downwind broad reach. At this point she was behaving beautifully, and once we had adjusted the sail trim we were able to leave the tiller for about 20 minutes while she maintained course. Kleen Breeze at anchor. 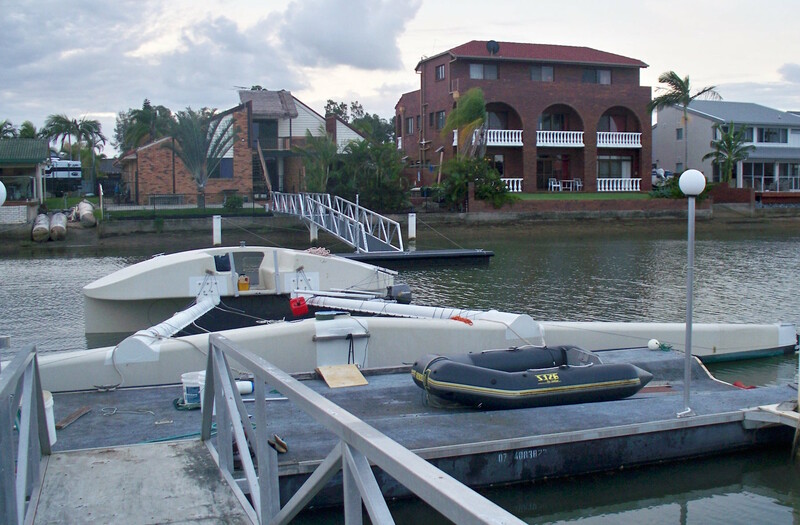 Dinghy ramp lowered. We lifted from the yard a week ago because of a good weather window,and sailed in light northeasterly winds and motored to Portico. Lighter than expected weight at 11 tons. 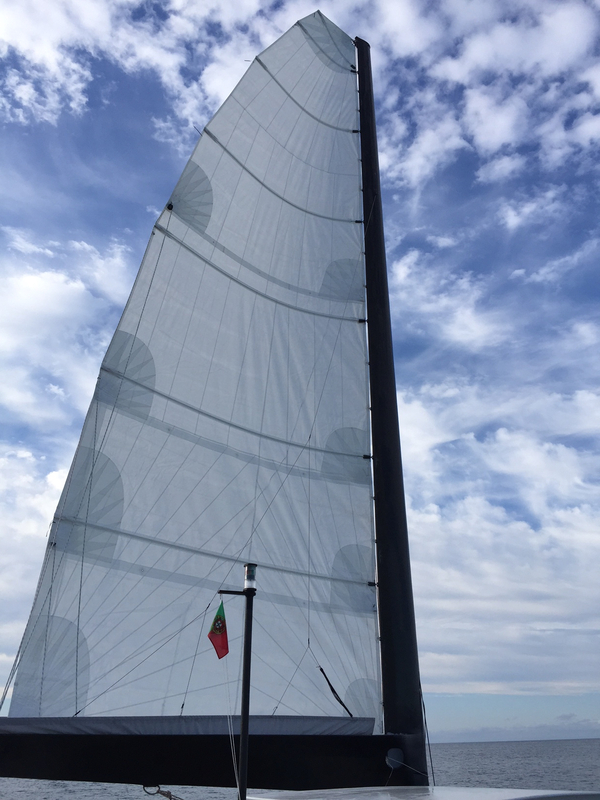 A couple of photos show us under a light close reach off Salema under foresail in 7 – 8 knots wind doing 5 -6 knots. 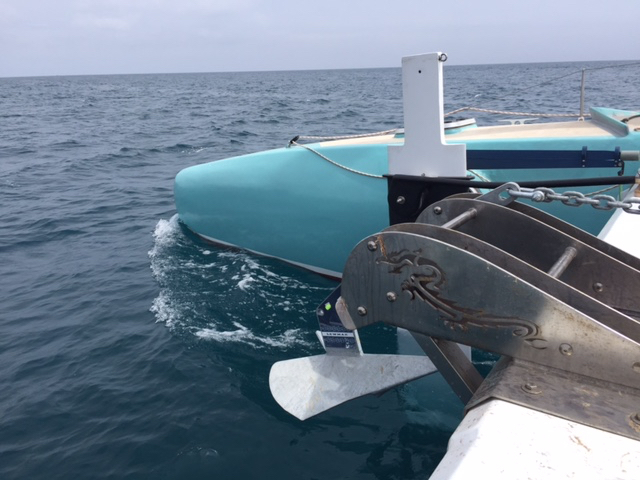 Tiller steering was light and could probably be handled by a simple Simrad TP323 tiller pilot. 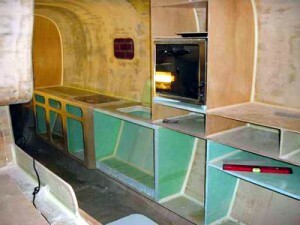 Been working last few days getting the electrics hooked up, and so far no problems. 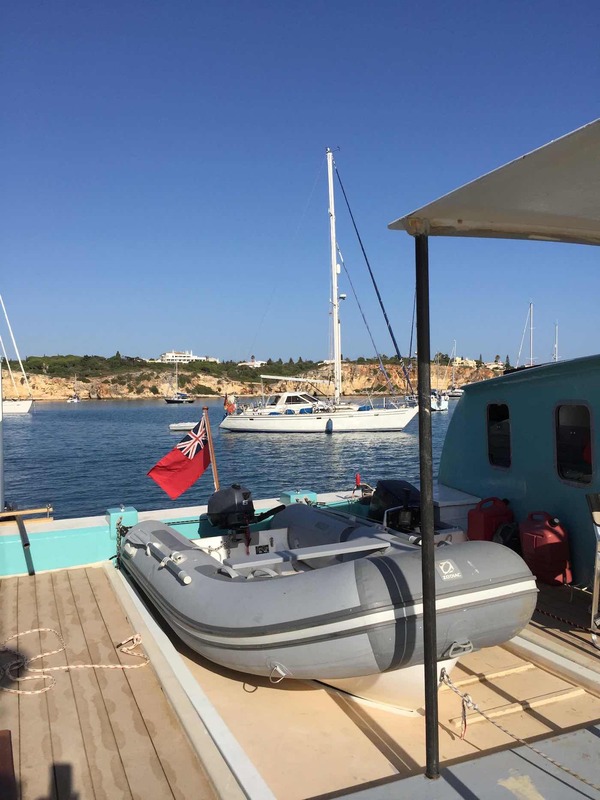 I have moored near Portimao on the east side of the river below Ferragudo, and as we have come early in the year we have a prime spot with a clear access route if necessary, and also just in 8 metres of good sand/mud with a 35 kg Rocna in tandem with a 45 kg Delta and 50 metres of 12 mm chain. Pulled them yesterday for a short spin out of the harbour and the Rocna had dug in well into mud, while the Delta which is 2 metres closer to the boat at the end of the chain showed clean blades with no sign of having dug in. Reckon the Rocna did not slip at all so the Delta had no opportunity to bury itself. 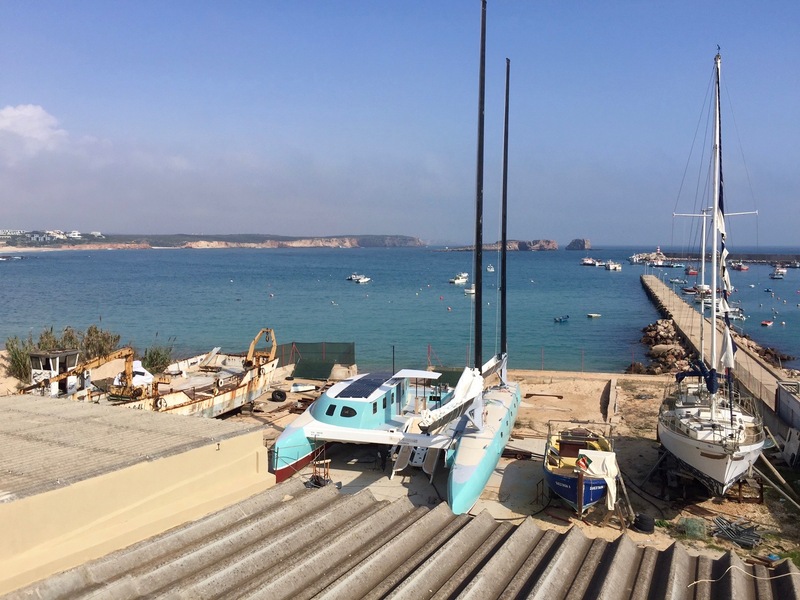 There were just 4 sailboats when we arrived, but 7 more have now came out of the marina to escape the heavy June to September fees. 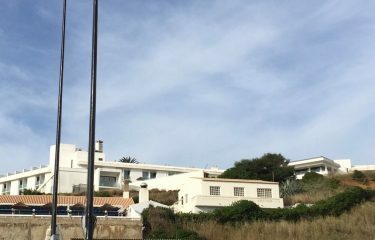 I reckon to stay here a month or so to work on the boat before possibly moving to Faro/Culatra in July. Riding 25 knot winds at the moment with a little sway but not much more than the monos around us. The owner of Luca Antara has had an accident which has seriously impacted him financially. 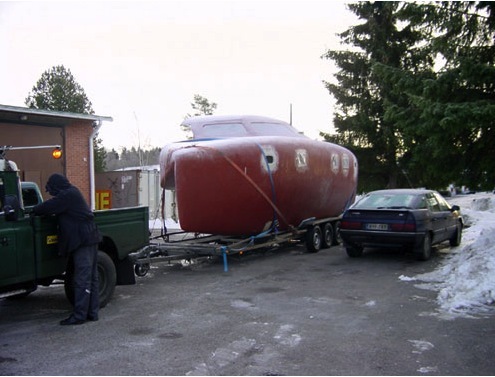 Consequently, he has to sell his boat. 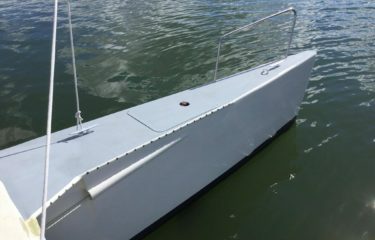 Details are at http://eepurl.com/cpxZHL A lot of boat and equipment at a seriously discounted price. 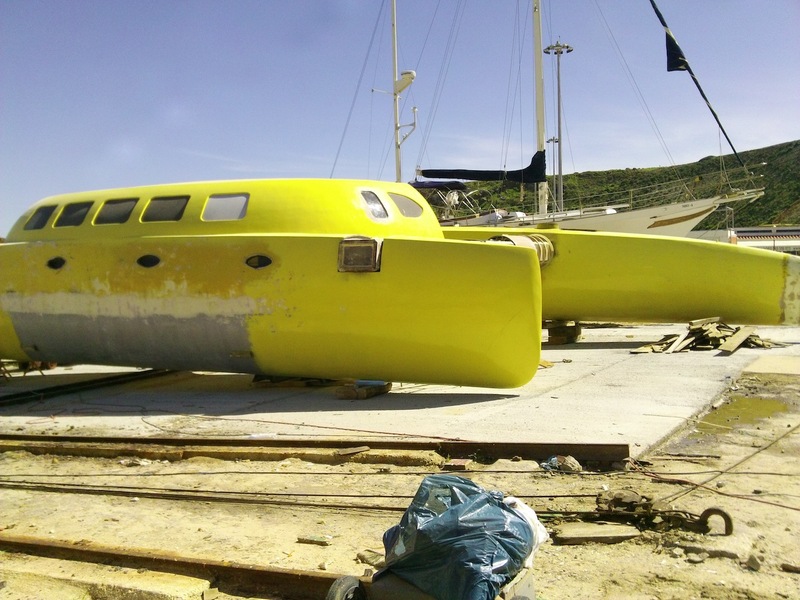 The hulls are now finished and are (mostly) painted. The masts, booms and beams are complete and will be installed shortly. The masts weigh 350 kgs each, are extremely stiff and are clear finished carbon. 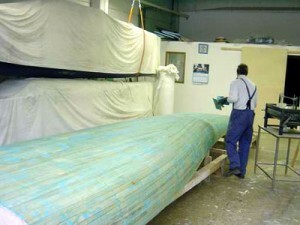 Windward hull weighs 1,900 kgs. “Ono” (Hawaian for Wahoo) a 15m/50′ Visionarry built by Arttu Heinonen in Finland. The layout includes the saloon from the Cruiser and the open cockpit from the Sport along with a few other changes, such as polystyrene cored beams and daggerboards, which Arttu says work well. Now we are sailing our seventh season with our Visionarry. The boat spent two years on the yard. 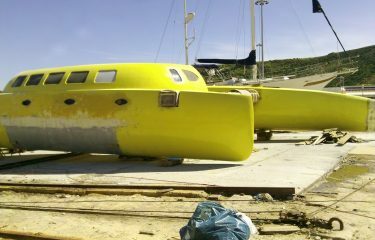 Now we have done some mods that have enhanced its sailing capabilities. 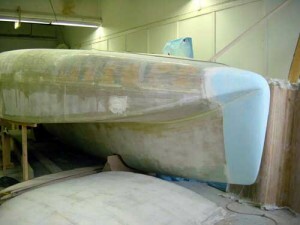 The rudder bearings are now from Jefa and we made bows a bit higher and are flat on top. We also added carbon chainplates for a down wind sail. We did some changes in the interior design which made the cockpit roomier and cozy. We have found the (disliked??) daggerboards useful. 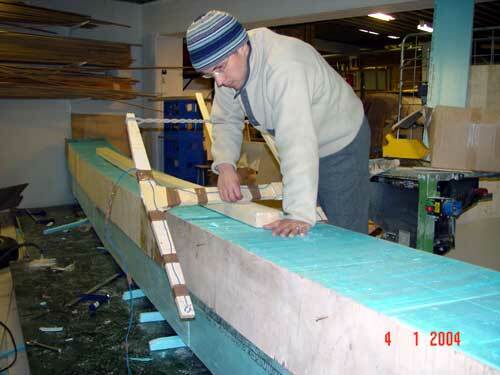 The asymmetric profile of thr daggerboards is effective. 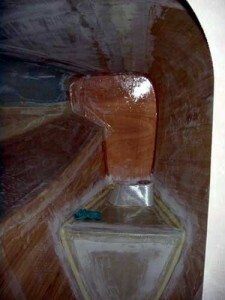 We also noticed that too much weight in the ww hull is not good, so we moved batteries and water into lw hull. Ww hull is still heavy enough. 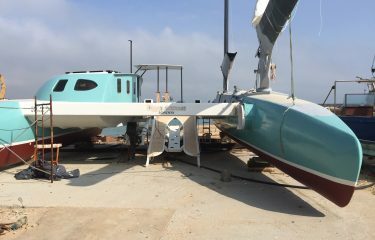 There will also be tiller attachments on the rudder stocks in the near future. 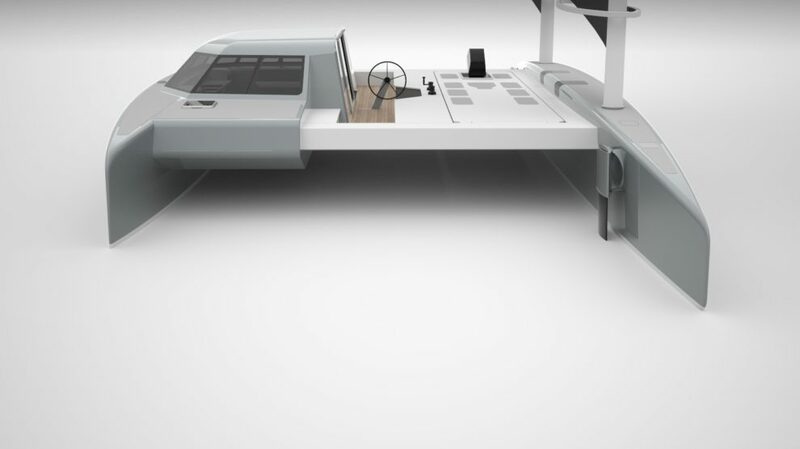 That will allow the use of a tiller pilot and also would like to try steering with a tiller for sportier moments. We have been cris crossing baltic and enjoyed of good sailing! The mast and the sails are still very good. Many thanks for Rudolf!! 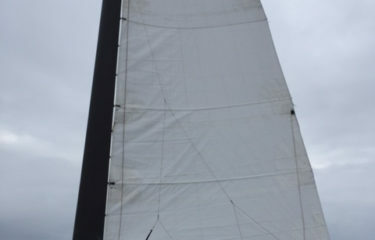 KitetiK (harryproa, Trevor Jack owner) hasn’t been out for a while but we had a delightful sail on Saturday. Here’s about 50 seconds of video. We launched the 16m kite from a dinghy. Although the wing tips were in the water for a bit and it could easily have gone pear shaped, it launched cleanly and was very well behaved. The kite pilot had it under control while we in the dinghy returned to the proa, got the anchor up and headed off. We measured (apparent) wind of 2.8knots at one stage. No doubt there was a bit more at the kite. And it wouldn’t have stayed up through that lull if it was much longer – but it did stay up and was very easy to manage when it drifted back. I think the highest apparent wind speed we measured was 12 knots and it was typically 8-10. So perhaps 6-8 knots of true. When we looked, we were often doing somewhere close to 5knots (the log unfortunately was set to record data only every 5 minutes but from that small sample there were several points around 5knots).